We desperately need to some shopping when we first arrived during O-week. So we took a bus to Indroopilly, which is another Brisbane suburb adjacent to St Lucia. I managed to get a standing fan for my room at College. A rare yet delightful Chinese dinner with Judah 5 cell-mates (outside College) that also marked my first month here. I must tell you that this restaurant's Char Kuay Teow cost as much as AUD$11.00! A gathering of collegians for an important announcement. But hey, can you see the speaker? This balancing act could be a favourite pastime here. By the way, I like this guy's hairstyle haha! My Henderson wing is said to be the most "happening" place in this College, ...especially at night! In Aussie, most buttocks are big LOL! Recently, a friendly soccer game ended up with push-ups. And we do together in the spirit of brotherhood. 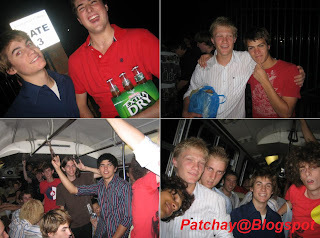 Tags: Patchay-Blogspot, Australia, Aussie and student life. This nice little suburb 15 minutes outside of downtown Brisbane is called St Lucia. Students make up almost the entire population here. Some of my university buildings can be seen inside the red box area. A mixture of ordinary brick and wooden houses can be seen everywhere. Delightful parklands and shady walkways are also aplenty. Little traffic, so no jams and therefore no stress. Conclusion: This place is good for studying, good for affordable living, good for sleeping ...oh yeah good for breathing fresh air too (really fresh in the morning). But life is SUPER BORING! My blog - Patchay@Blogspot is almost 1-Year old now. First Anniversary falls on May 8. I decided to launch this blog on that date exactly one year ago because of good feng shui LOL, also because 8 is a good number to Chinese. I initially thought of setting up a blog that will keep Me busy for a maximum of ONE YEAR period. I never thought that I could achieve something out from blogging; so I thought why not just run a blog for FUN, just like many of my friends back then. I must admit that I'm almost burnt out, very exhausted from blogging already. After days of deciding, I thought that NOW could be the best time to Call It A Day. I'm officially QUITING the blogosphere and all other forms of online activity (except email, MSN etc). It's my final decision. I've made up my mind and no more second thought. Tragically, I announce that this will be my LAST blog post. This decision was mainly attributed to what I want to prioritize for the time being - my studies. Now that I'm a second-year university student, there's by far too many commitments to compromise with. So I guess taking a BREAK from blogging will be the best thing right now. Also, the lack of motivation to update this blog regularly may have cause Me to make this decision. Looking back at my participation in the World of Blogging is simply amazing. I feel proud of what I've learned and discovered from the blogosphere, such as HTML/CSS knowledge amongst others. I must admit that blogging has changed my life at least to a certain extent. I don't know whether you believe that blogging can do wonders to you, but I do believe in it. Through my blog, I've met many wonderful people in real person, from infamous bloggers to avid and famous ones as well as many other carefree college boys and girls. I was never so 'happening' like before, for instance, many social outings at the end of last year were somewhat related to my blogging exposure. I met this bunch of people whom I now call them my "New Friendz". They made Me a poser like above. For once, I thought that I've had enough of this social thingy. I shall now spend more time on other important things, perhaps at things more beneficial to Me as I grow up to be a fully-matured adult. Well, it's indeed very SAD that I've to make such an unexpected announcement today, particularly ahead of my blog's Anniversary. Before I end this post, I sincerely wish ALL THE VERY BEST to my fellow blog supporters and readers, be it long-time mates, school friends, college-university friends, blog-mates and other virtual friends that have been continuously supporting Me. I hope you all have been enjoying reading my blog. Thank you very much for making this blog ALIVE! 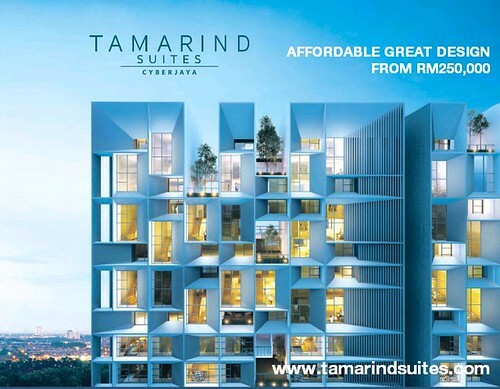 In future you may contact Me via email or MSN. Their addresses are posted in my Profile page. WHAT DID I JUST SAY??? OMG! Hey guys, you know what? This is a Tagged to FOOL you guys lah. I was tagged to do this crap post by Ah Beng [BengHan.com]. Thanks to Him I have to frighten you guys! 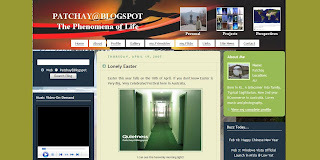 The blog is celebrating 1st Anniversary and is expected to ride high this year. So how can I do this? Quiting now especially when my blog is getting more and more unique visits per day is the DUMBEST thing to do!!! And now is my turn to randomly KENA-KAN some people ... kakaka. This one, this one, this one, this one and this one. Let's close down our blogs together together ok? Anyway Happy Birthday to my Blog, in advance !!! 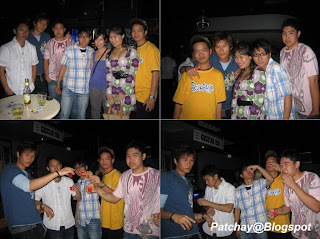 Tags: Patchay-Blogspot, blogging and anniversary. The Reiji Dance Party at Cesars in downtown Brisbane. Cheers ... and don't get drunk people! Singapore - Japan - Malaysia - Hong Kong = perfect mix. Saki, Me and Kaori; both girls are from Japan. Pharmacy student, Veng Wai is from Malaysia as well. Me doing the lamest thing in my life = pole dancing. How nice if we were chauffeured back home by this car? Haha... I was just day-dreaming again lol. 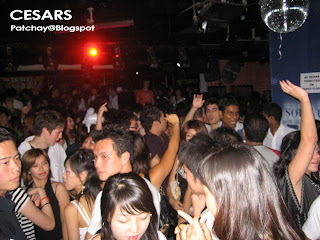 Another party post coming up next. Here's something outside college life. After evening church service on April Fools' Day, we had Thai dinner at a place called Hawken Drive to celebrate Elysaa's birthday. Happy Birthday Elysaa !!! The birthday girl is also from Malaysia. 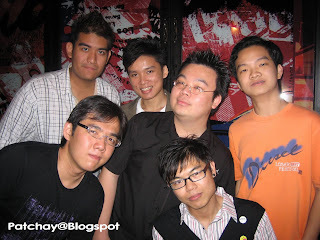 Suny (Macau), Johanan, Joey (both Singapore) and Jessy (China) are nice people to talk to. And they're very funny. They smile and laugh more than talk. After dinner is time for "cam-whoring". My eyes can barely open after working on the computer for many long hours. From right: Me, Daisy (Korea) and Ai Lin (Malaysia). Everyone at the dinner. These people are my cell group mates from "Judah 5" at Hope Brisbane. 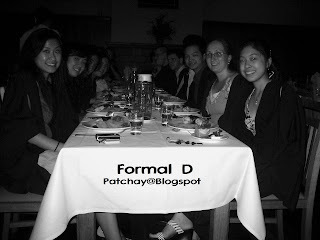 This is a dinner outside Emmanuel held exclusively for first year collegians or "Freshers" on 21st March 2007. College senior ladies brought all young men to dine Indian food, while senior guys invited first year ladies out for Western food. This is the rule of the game. Three buses arriving to bring us all to our respective restaurants. At this time I'm feeling SUPER hungry liao! We arrived after 15 minutes bus ride. The signboard says: "Award Winning Indian Restaurant". Let Me try it out first! Yummmy... mouth-watering isn't it? Never thought of having some kinda Malaysian Nasi Kandar here in Australia. The dinner ended soon after that, some went back to college including Me, some stayed on and partyyy! 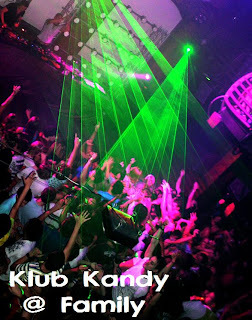 I'll partyyy the next time!! !